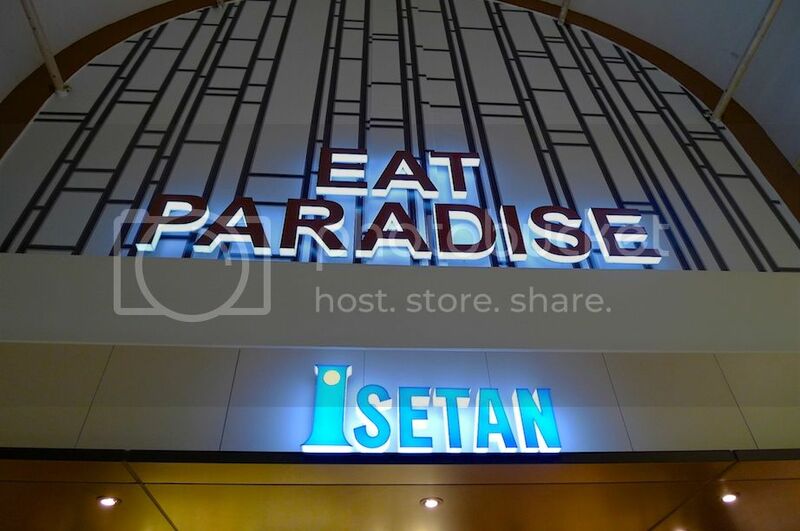 Last week, my family and I went to Isetan Eat Paradise in 1Utama for dinner. 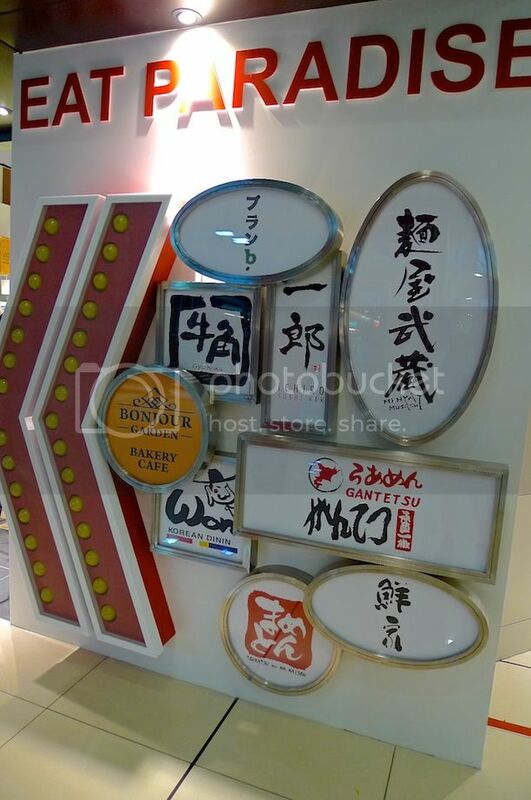 There were many Japanese restaurants at Eat Paradise, and I guess most people are already familiar with Menya Musashi and Ichiro Sushi Bar. 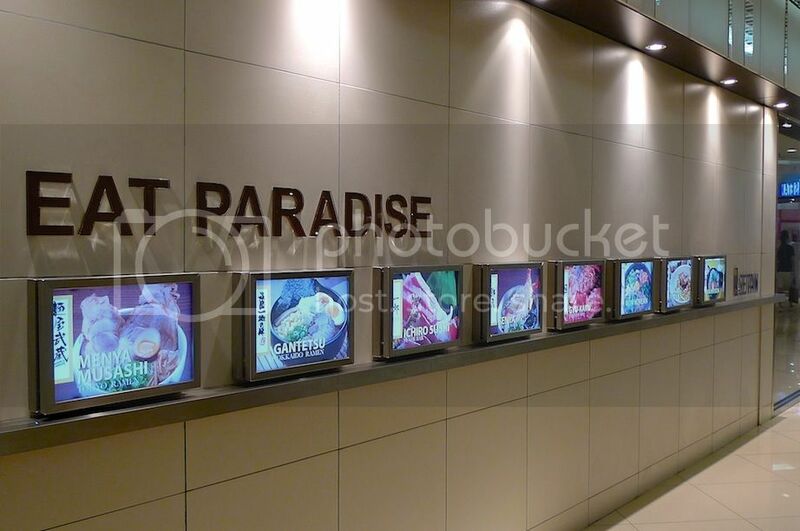 The entrance to Isetan's Eat Paradise. 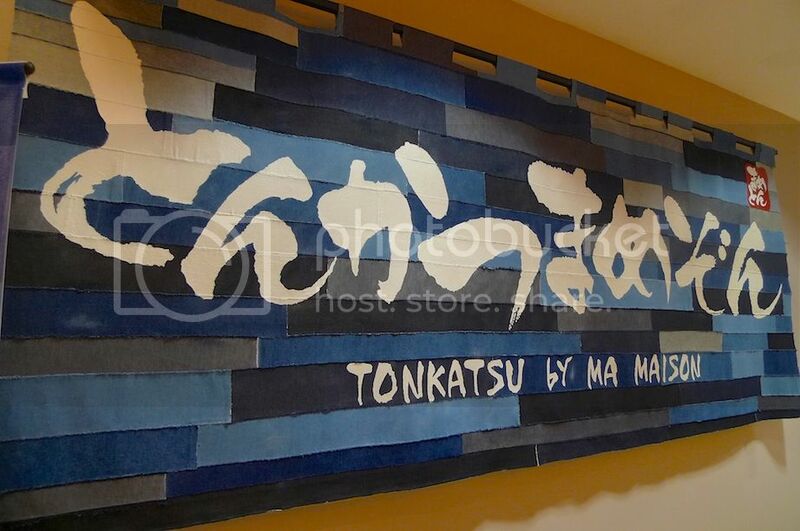 We did not go to Menya Musashi. 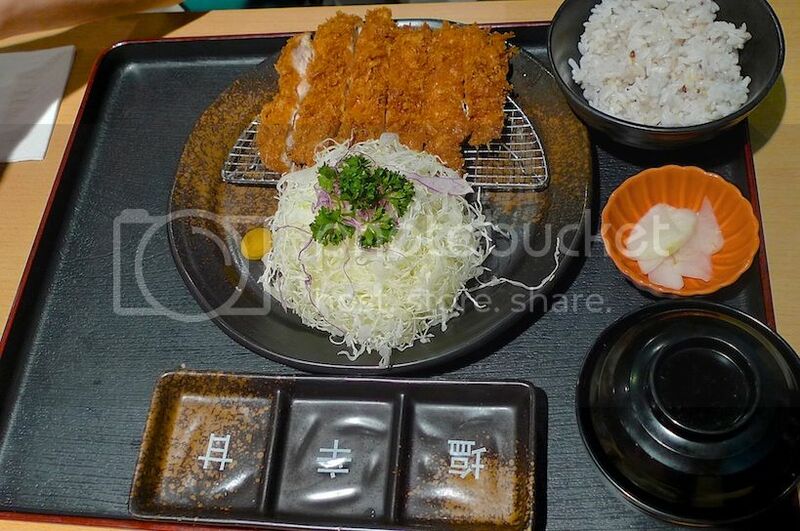 Instead, we went to Tonkatsu. 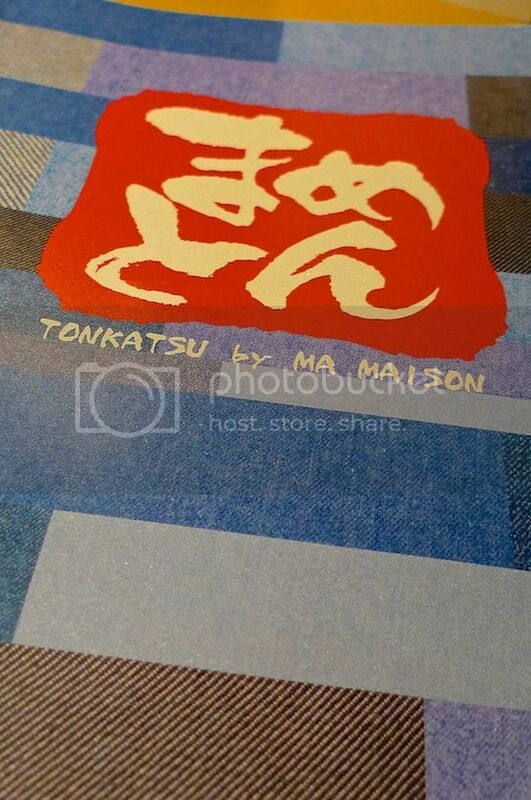 Or more precisely, Tonkatsu by Ma Maison. It was our first time there. 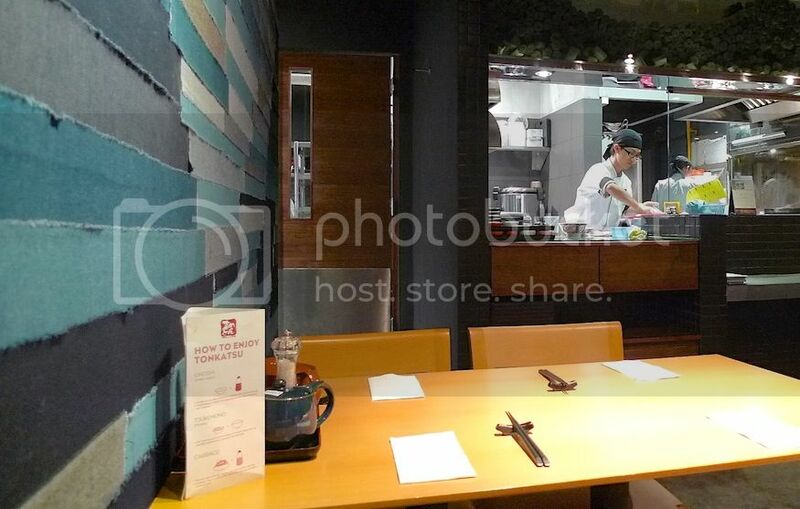 It was around 6pm and the restaurant was not crowded yet. Perfect! It's probably not crowded as it was Chinese New Year week and most Chinese people were back in their hometowns. 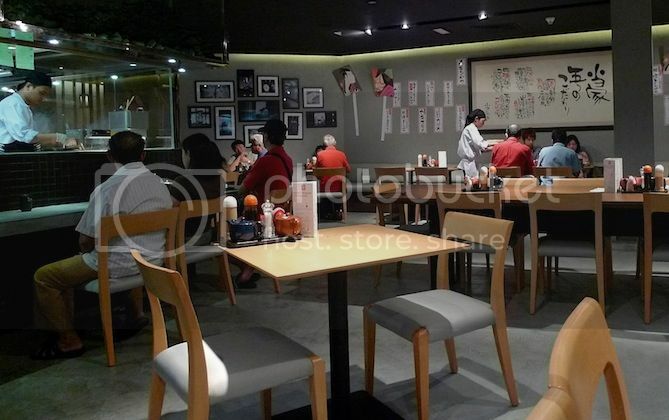 No guarantees it won't be crowded now that Chinese New Year is over! 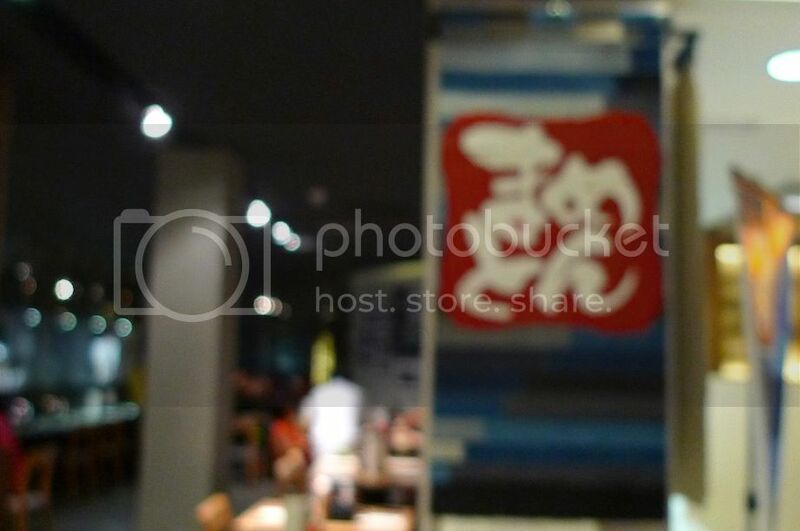 The restaurant interior was pretty interesting. 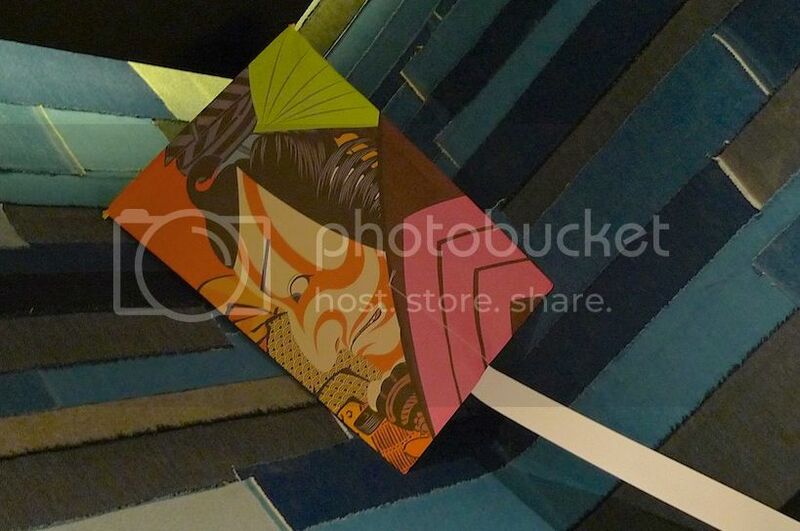 Is this a kite? But look at the wall! I like the wallpaper! It looks like something cut out from jeans, don't you think? Haha! 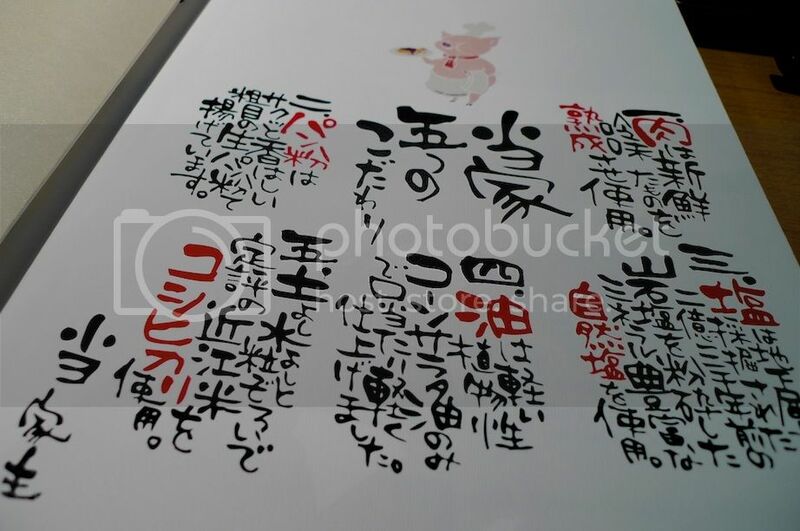 Even the menu book cover has the same theme as the wall. 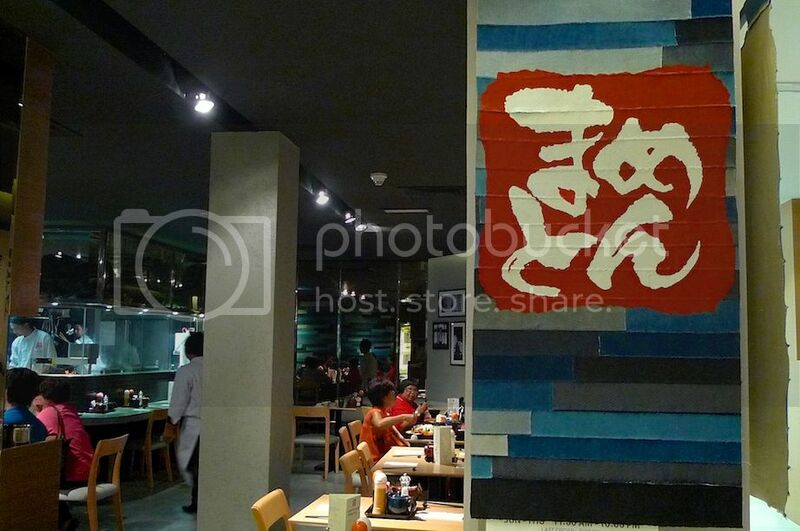 If not mistaken, this restaurant has its origin at the Mandarin Gallery in Singapore. There was a variety of sauces and condiments on the table. 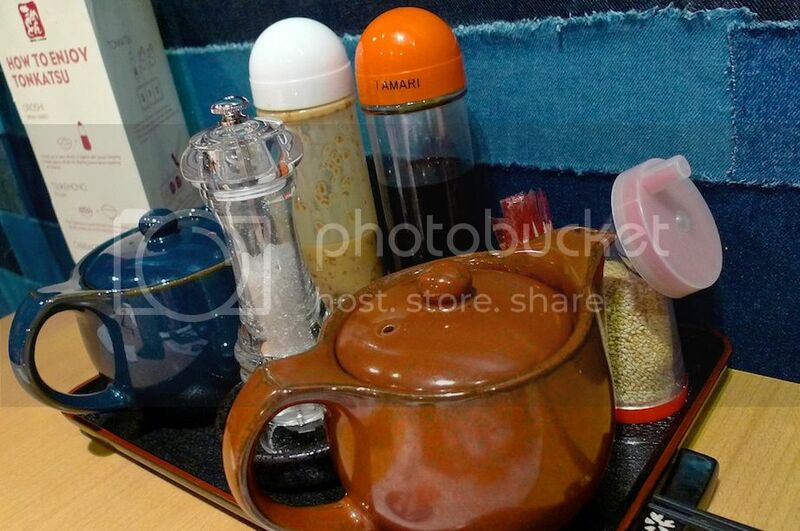 The 2 teapots contained different tonkatsu sauces - one sweet and the other spicy. 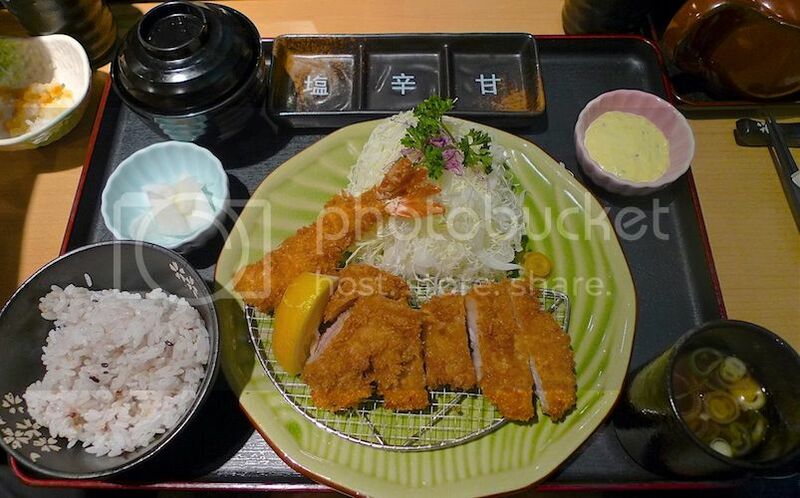 Or you may just want to check out what exactly tonkatsu is HERE. 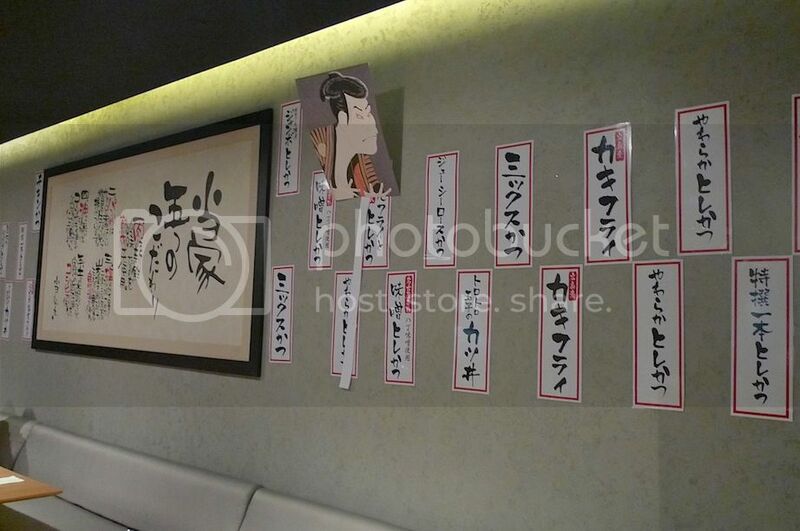 The menu was actually quite extensive. You can choose from pork, to chicken, to seafood. 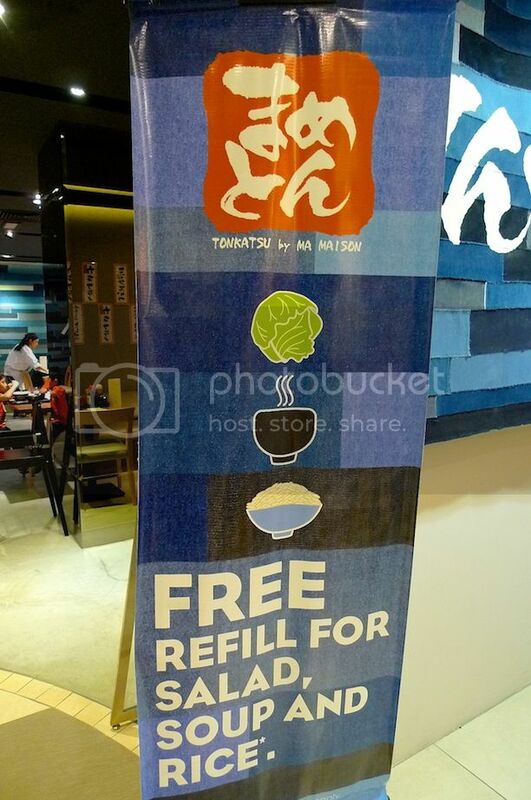 And the good thing is, you can have unlimited refills of rice, cabbage (salad) and tonjiru (pork miso soup) with every set you order. 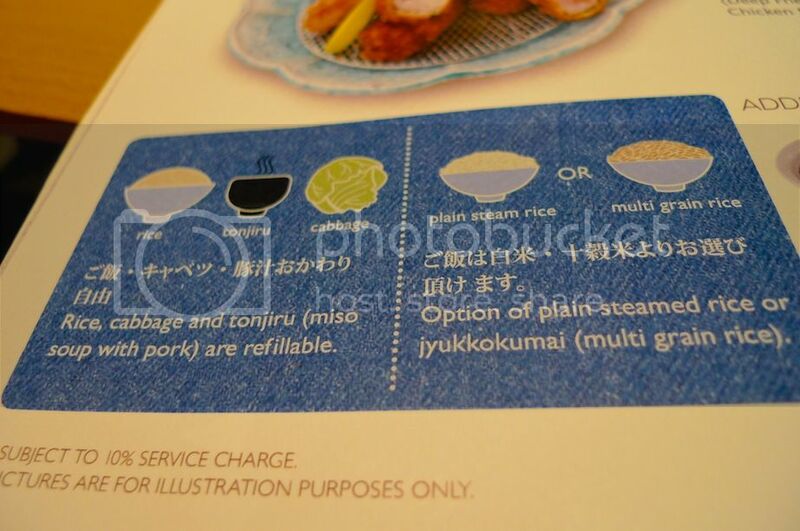 For the rice, you have the option to go for either plain white rice or multi grain rice. At first, we were a bit confused on how to order and enjoy the food here but luckily, they have a pretty good printed guide to help us out! 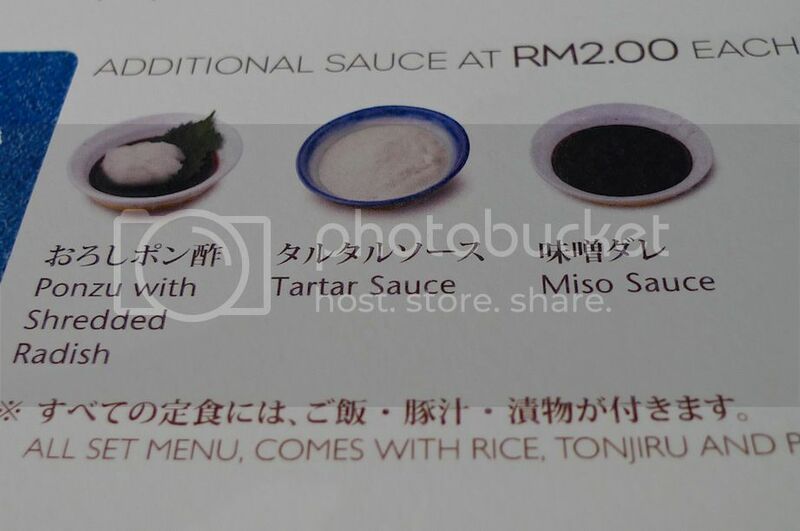 You can also order additional sauce at RM2.00 each. We did not order any as we were already overwhelmed with the variety of sauces and condiments on the table. 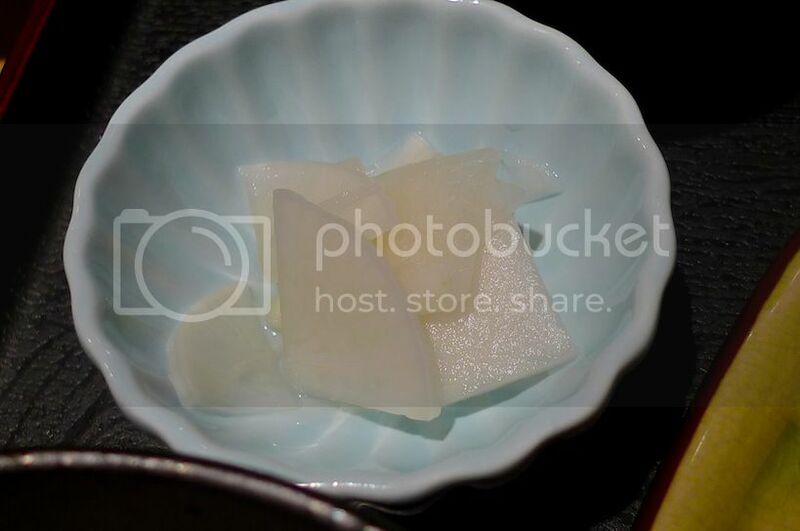 After ordering our food, it did not take very long before they came out with the Oroshi (white radish). 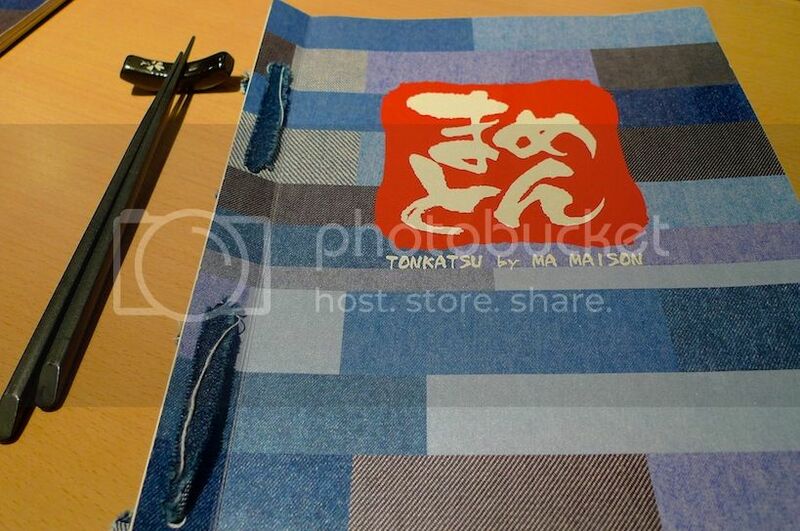 It's customary to start with Oroshi before the Tonkatsu as it helps to refresh the digestion before the meaty onslaught! 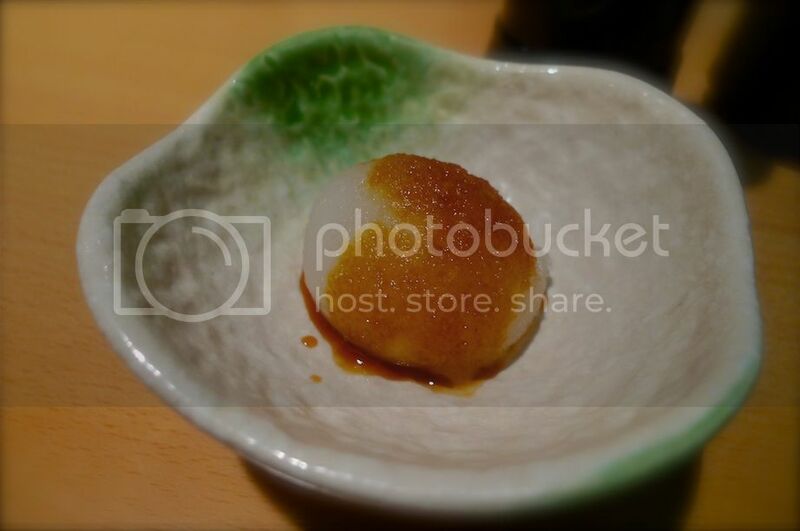 The Oroshi can be eaten plain but I like it with some Tamari (Japanese soy sauce) dressing. Yum! 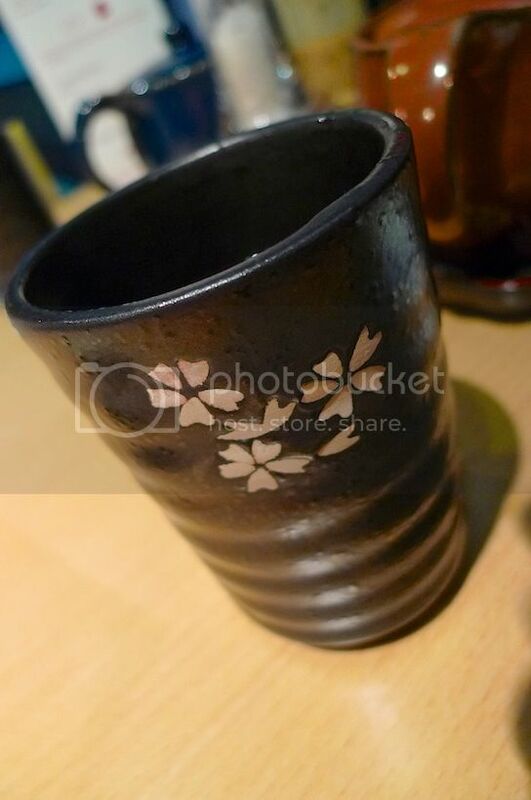 Every set you order also comes with a free flow of Japanese Roasted Barley Tea. 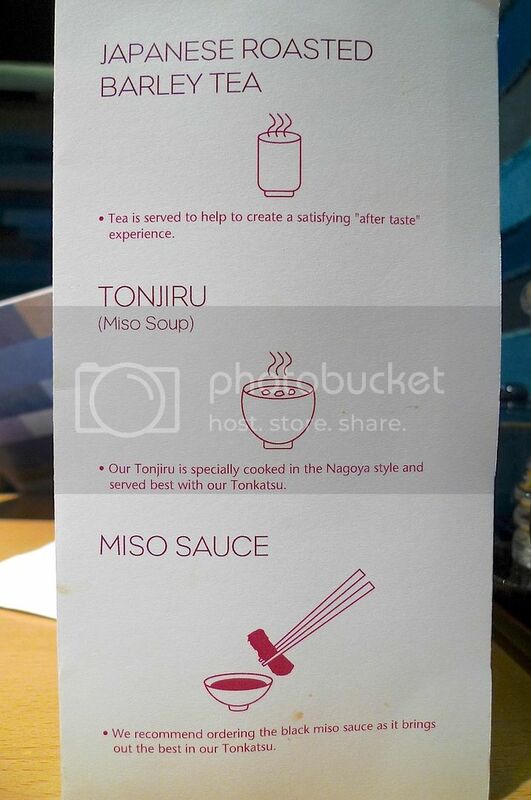 The tea was perfectly suited to accompany the Tonkatsu. Notice the 3-compartment plate? 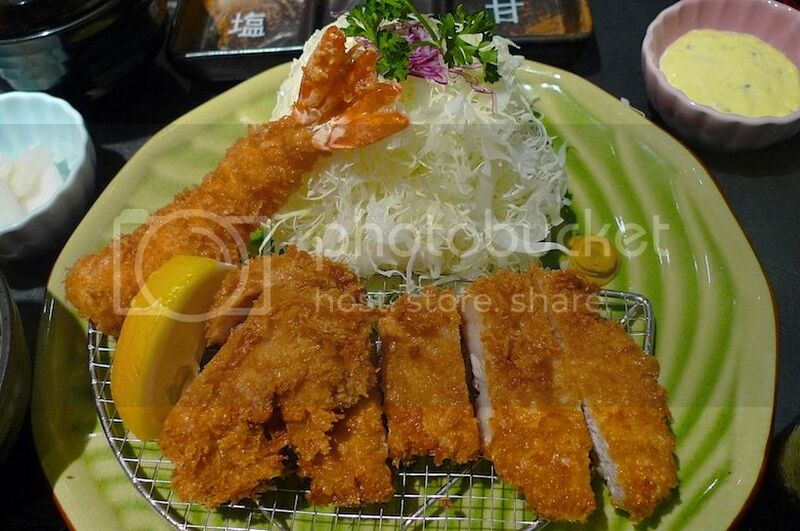 That's for you to put in the rock salt and the tonkatsu sauce. 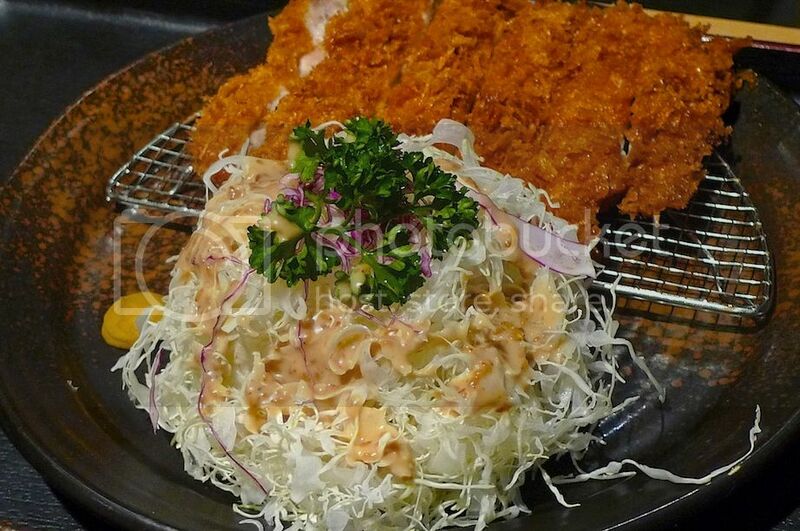 Grind the rock salt into the compartment on the far right, and filled in the remaining compartments with either the sweet or spicy tonkatsu sauce or both. 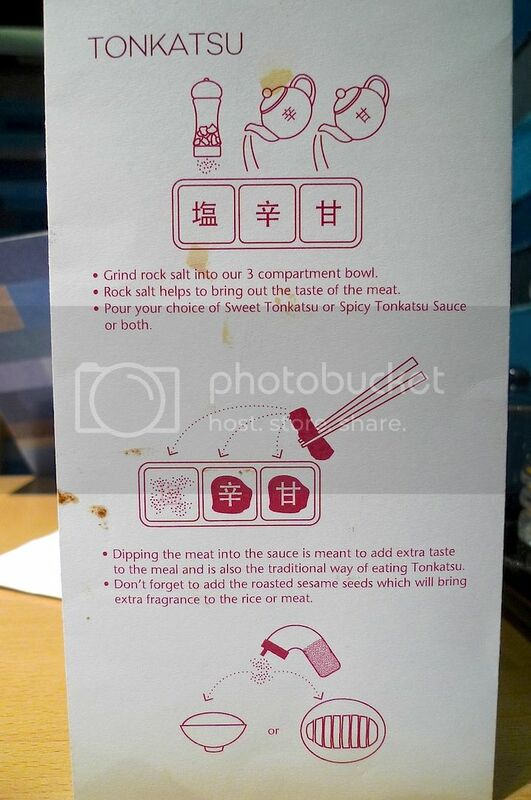 The rock salt is supposed to help bring out the flavor of the meat. 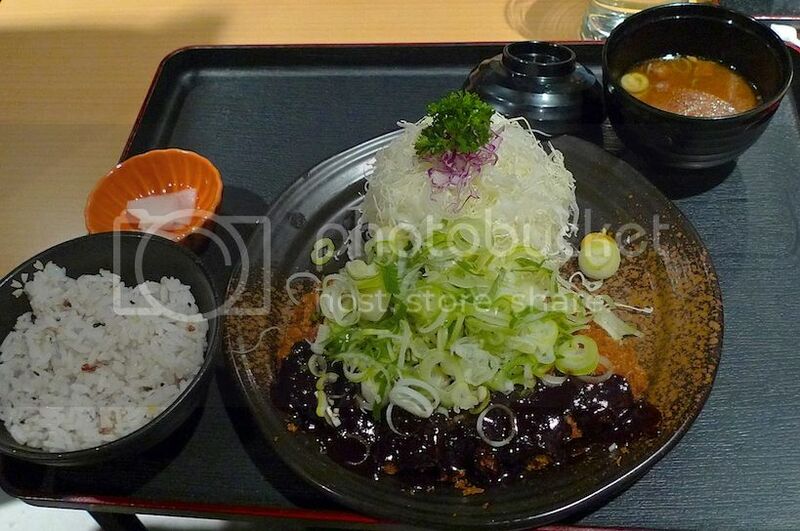 However, I found myself dipping the meat in the sweet tonkatsu sauce, which I like best! All meat and no vegetables is bad for health so it's really nice to see a huge portion of salad next to the meat. The shredded cabbage slices are best eaten with some salad dressing. 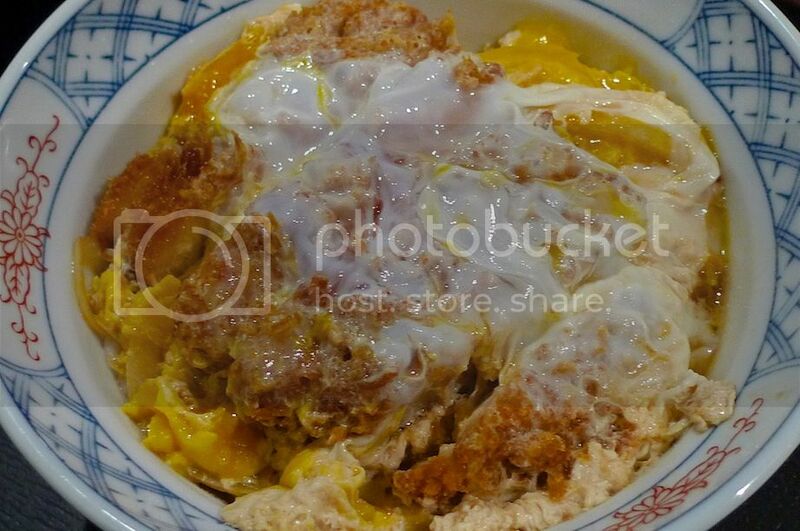 This looks really yummy, no? This was delicious! Yummy!! The pork loin was juicy (and fattening!) and was of course better (and more sinful) than the pork fillet. Can you see that dollop of brownish yellow-colored poo on the plate? Well, that's not poo of course, but it sure looks like one to me haha! Actually, I am not sure exactly what it was but I think it's spicy mustard. 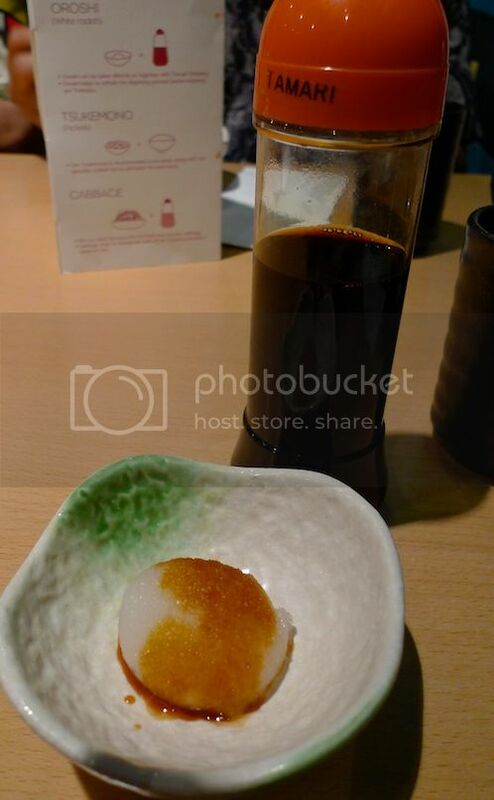 The rock salt, sweet and spicy tonkatsu sauce to dip my meat in. My multi grain rice. 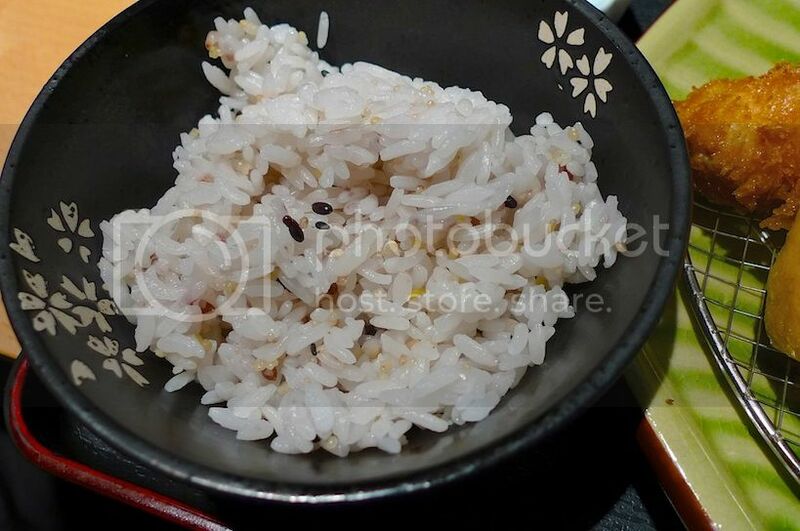 I added some roasted sesame seeds onto my rice later which made it more fragrant. 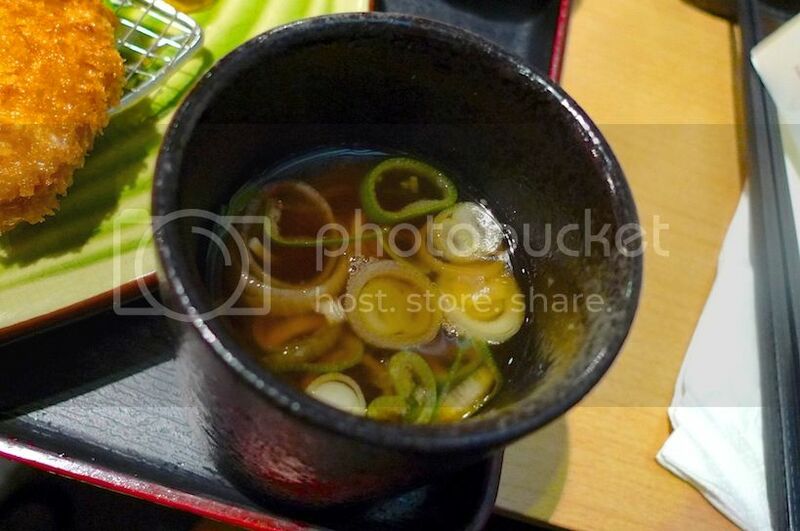 The Tsukemono (pickles) complemented the rice. 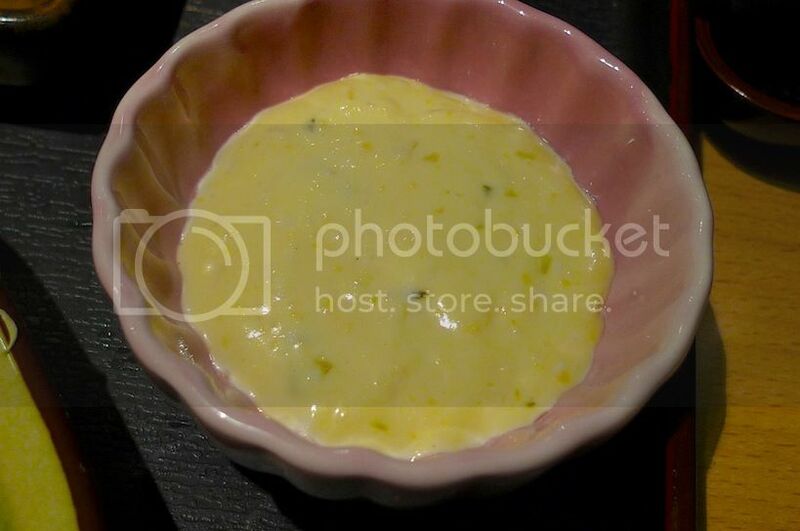 A yellowish sauce (I think it's tartare sauce) came together with my set. For the fried prawns perhaps? 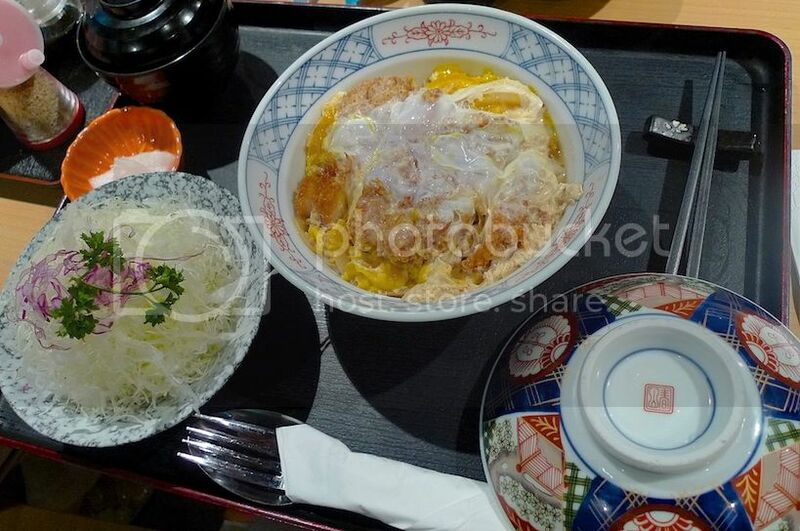 Also included in this set was a small cup of noodles in soup. It was delicious! 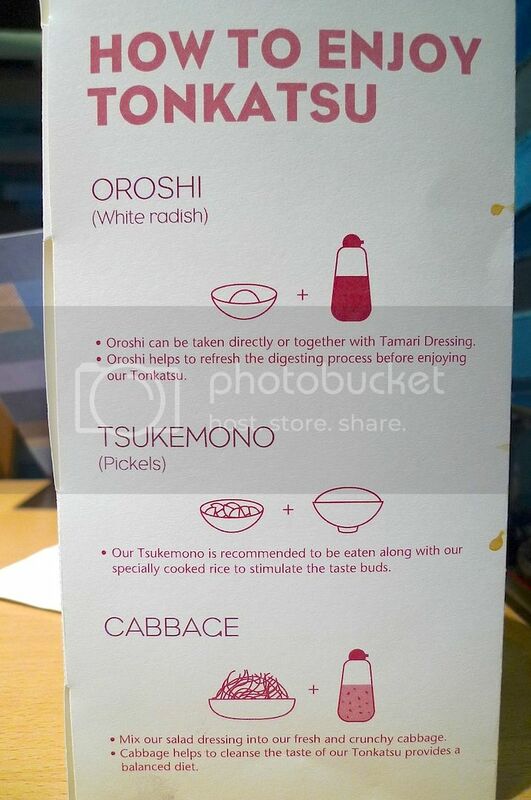 I wanted more of this noodles actually but unfortunately it was not refillable like the salad, tonjiru and rice. I ended up with refilling the salad and tonjiru twice. All my family members loved the salad and had it refilled. 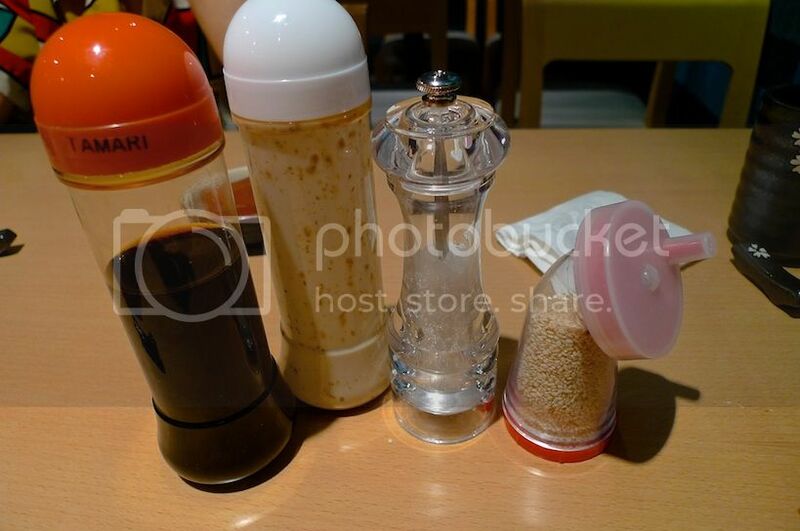 These are the four must-have condiments which I laid out on the table just to take a photo. LOL! 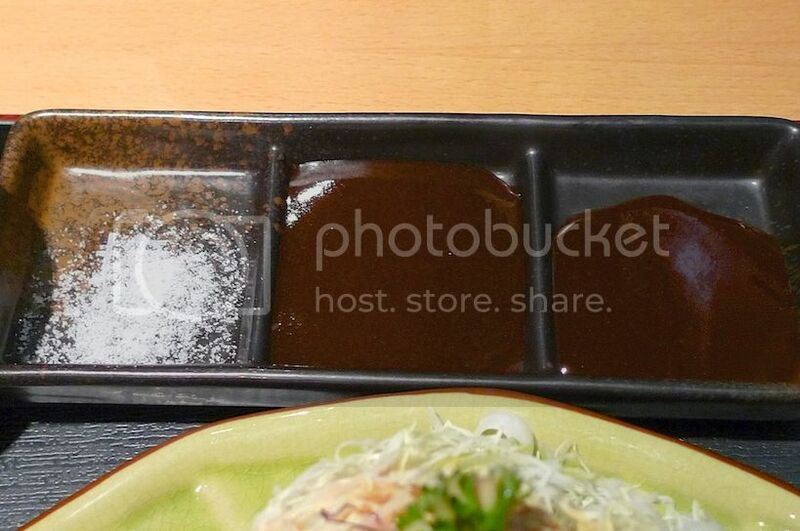 From left to right : Tamari sauce, salad dressing, rock salt, roasted sesame seeds. 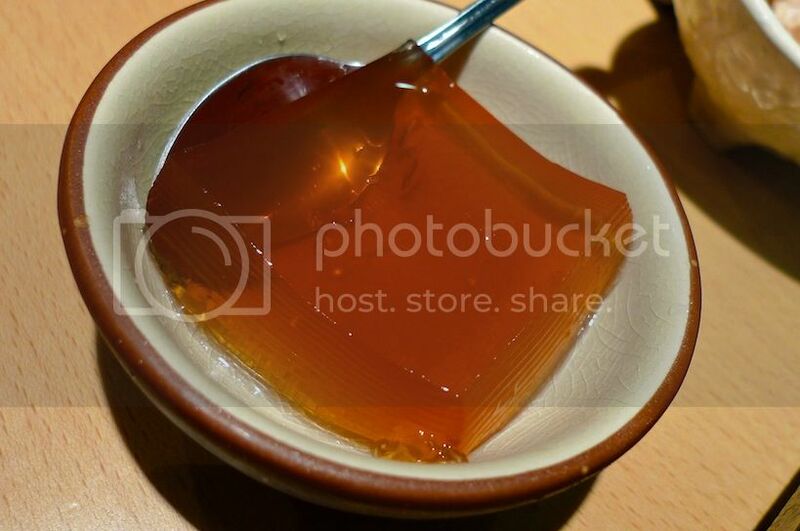 After we were done with our dinner, we were given complimentary desserts in the form of collagen jelly. Yes, collagen. Good for skin and health. Although I wonder how much actual collagen were in the jelly. Too bad it's not refillable. Haha! !